Location: A series of fires are located on both sides of the Yukon River within the Galena Fire Management Zone and the western end of the Tanana Zone, stretching over 150 river miles from east to west. 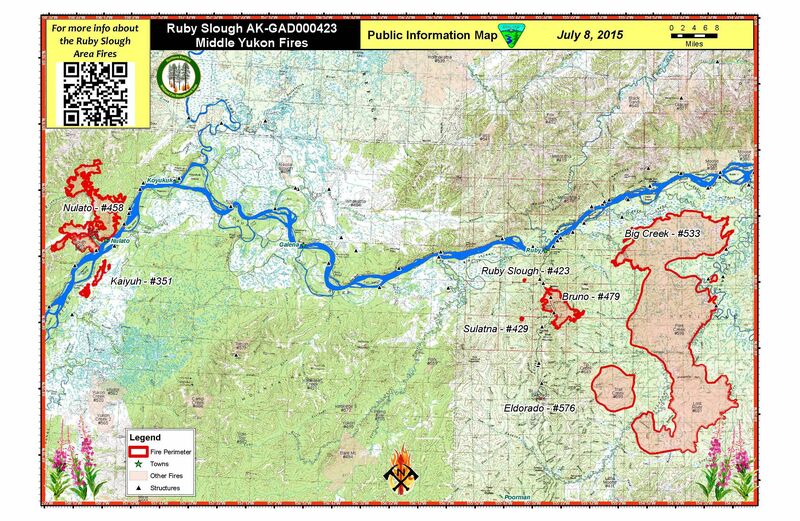 The major firefighting efforts at this time are concentrated on 3 fires on the south side of the Yukon River near the village of Ruby and on 1 fire near the village of Nulato. Fire Names: The following fires are now being reported in the daily Incident Status Summary (ICS-209) as “Middle Yukon Fires”: Nulato #458 (39548 acres), Ruby Slough #423 (49 acres), Bruno Creek #479 (13480 acres), and Big Creek Two #533 (283760 acres). The Eldorado #576, Kaiyuh #351, and Sulatna #429 fires are in a monitoring status. Nulato Fires: Twenty five buckets of water were dropped on the eastern flank of the Nulato fire on Wednesday, taking advantage of the moderate weather to subdue any lingering fire. Community and structure protection work is completed in Nulato and Koyukuk and will be left in place for contingency actions. The Nulato 1 crew will be retained in the area to secure suppression efforts. Ruby Fires: Wednesday was a relatively slow fire day in the area. A reconnaissance flight confirmed the Big Creek Two, Flint Creek, and Lost River Fires burned together. GPS was used to refine the mapping of the perimeter estimating the fire size to now be nearly 284,000 acres. Firefighters reconned the south end of Poorman Road and worked to hold and maintain site protection. The Ruby firefighting crew was hired on Wednesday to staff local fires. Crews at the Quinn, Smith Slough, FWS Admin, and Atchley Cabins were re-supplied and are working to complete structure protection. Structure assessment and protection activities are continuing along the Yukon and Nowitna River banks and will be prioritized based on projected fire progression. To date, structure protection has been accomplished on approximately 18 of the nearly 60 remote structures. The public is urged to limit travel on Poorman Road, which is experiencing active fire, to minimize conflicts with the firefighting forces. Other Galena Zone Fires: The Galena Zone BLM personnel are closely monitoring other fires in the zone. Structure protection plans are in place for any fires that threaten private property. There is a Notice to Airmen in effect for a 25 mile radius around the village of Ruby. For other areas, please see and avoid air traffic around fires. Weather: Humidity will be in the 40% range today. Isolated showers and isolated thunderstorms are possible along the thermal trough that has set up over the Alaska interior and will remain in place through Saturday. Gusty winds around thunderstorms may cause erratic fire behavior.